Atlas F1: Driven to Drama: Talking to the Makers of "Driven"
Driven to Drama: Talking to the Makers of "Driven"
Warner Brothers Pictures' Driven is an ensemble action drama about the lives of race car drivers in an unspecified racing circuit. 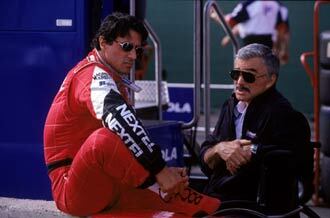 Sylvester Stallone wrote the script and plays Joe Tanto, a retired racer who returns to guide young driver Jimmy Blye (Kip Pardue) in the early stage of his career. In writing Driven, Stallone says he found metaphorical similarities to his other famous sports drama, Rocky. "I like films that deal with two stories at the same time," Stallone explains. "In other words, you have boxing in 'Rocky', but it's really not about boxing and it's not so much about Rocky. It's about a feeling, it's about a kind of spirit and a dignity. Racing is not just about cars going on a track, it's about dealing with your own fear, about dealing with the competition, and how life is this constant race. You win some, you lose some. It's about keeping your eye on that finishing line the whole time. It's a metaphor, because what we do every day is race. We race from the moment we get up, race to get here, race to get the interview, race back for your deadline, right? Why are people drawn to racing? Because they do it all day long from the day they're born." If much of the criticism about Driven is the unrealistic events added to it, Stallone is the first to admit to using artistic embellishment, saying he did so to heighten the drama and excitement of some scenes. However, Stallone claims such embellishments were based on facts. One of those scenes features Tanto (Stallone himself) driving around the track picking up coins in his rear tire. Stallone claims the idea is based on a 'trademark stunt' he refers to Formula One legend, Juan Manuel Fangio (although it should be noted that Formula One experts could not confirm this tale). "Juan Fangio would lay a piece of cardboard down at the corner [of the track]," Stallone explains. "When he would drive around the corner at 130, 140 miles per hour, after 20 laps of going around he brought the cardboard up which was the size of an 8 x 10 piece of paper and it was just one line. Just showing you how he cut it so sharp every time. Even three inches was unacceptable. That's how precise they are and he could, literally, they would put a dime on the cardboard and he'd pick up a dime every time at that speed, that they're able to focus on that. So, I took and made it so the man could pick them up on his tail so he'd be able to slide and pick it up which is almost impossible, but it could be done. At high speeds it would take a little practice." 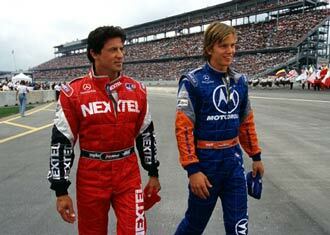 Stallone says he found out about such phenomena during his extensive research as writer, which included attending dozens of F1 races as a guest in the paddock, as the movie was originally planned to be about Formula One. 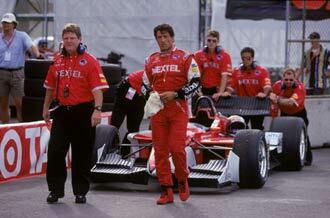 However, after a fall-out with commercial rights owner Bernie Ecclestone, Stallone announced in February 2000 that the movie will be based on the CART series in the United States. Once that was decided, young actor Kip Pardue chose Alex Tagliani as his mentor. "The reason I spent a lot of time with him is because it was his second year in the circuit," Pardue said. "He was very new to the sport, he's my age in real life or maybe a year older, and went through a lot of the same things that Jimmy Blye [the character in the movie] went through. 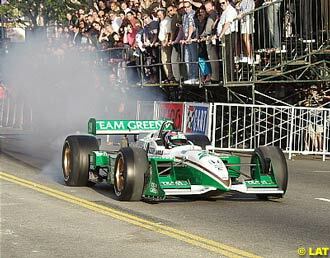 He was actually winning two races in 1999, and eight laps to go, [he had a] mental breakdown and spin out. No cars around him, he just lost that focus, lost that drive, pardon the pun, but wasn't driven enough to win the race. It was really great to talk to him and keep things in perspective, but it's more or less what they didn't say that surprised me the most of all. These guys go out there and practice and you talk to them and it's like hanging out. 'Hey, okay, I'm gonna go drive my race car 200 miles an hour real quick,' just like it's the most natural thing in the world for them to do and they're just the most personable guys. I don't even think they realize how amazing they are." German actor Til Schweiger plays Blye's rival, Beau Brandenburg. Schweiger says he studied F1 World Champion Michael Schumacher to prepare for his role. "What I learned from him is that he's totally relaxed before the race, or at least he makes you think that," Schweiger reveals. "I got to feel his pulse and it was 60. There was nothing, so I was more nervous asking him than he was before going in like three minutes before the race." 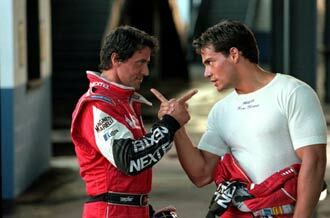 Chilean actor Christian De La Fuente learned from Chilean driver Eliseo Salazar. "I spent two races with Eliseo Salazar and the last one I went to Vegas and was with him all the weekend since he woke up at seven [o'clock] and did his workout, run three miles and all the preparation," De La Fuente said. "I didn't know they drink a lot of Gatorade, for example. They have to drink Gatorade every hour because they get dehydrated so they need that sodium. All the preparation when he gets in his trailer by himself, he prays and then he goes the last time to the bathroom and it's 10 minutes before he goes and checks his car. He always gets in the car from the right side, so all the things that you don't know. Little by little you just learn all those little things about the racers. That weekend that I spent with him in Vegas was very good for me because that Monday I had my last audition for the movie. So, I went more confident that I would do a good job because I had all that information in my head and it's a big head so I can have a lot of information." Pardue played football in high school, which led him to his first major role in "Remember the Titans". Once he started driving race cars, he developed an appreciation for a higher level of competition. "Driving combines two different worlds for you," Pardue said. "It combines this huge adrenaline rush and this sense of calm and it also combines massive amounts of thought process and zero thoughts at all. So, hopefully you can find that middle ground of just kind of really relaxing into this thing and being comfortable. I don't know how. It makes me uncomfortable sitting in this room knowing that they're out there. It's so intense. Playing football my whole life, knowing what it's like to step out on a field with 30,000 people there, knowing what it's like to hit someone as hard as you can, I have no idea what it's like to go to work everyday and have the risk of dying. I never felt like I was going to die on the football field. These guys could die, like that and as we all saw with Dale Earnhardt." To add elements of realism to the film, director Renny Harlin shot footage of real races, and even shot some of the actors' dialogue in moments before a real race began. Even Harlin himself was impressed by the cooperation he received from racers under pressure. "I went to Australia, Japan, Brazil and all around America and Canada shooting the race scenes and many of them I didn't have actors with me and I just was shooting the race," Harlin said. "Also, sometimes in many of the races before the race they would go on the track and we would put our camera car on the track and they would race with our camera car. To me, it was amazing that the tire manufacturers and the engine manufacturers would allow that because these cars cost millions and usually the engines are built for one race and then they are done. To do some extra laps just for the movie I couldn't believe." Harlin also used computer technology to portray aspects of racing never before seen on film. In the racers' point of view shots, the frame blurs around the edges to simulate vision at 200 miles per hour. During a rain race, digital graphics painted rain drops falling onto the visors of cars. In fact, Harlin was still working on the movie's 630 visual effects shots three weeks prior to the film's opening weekend. "We learned everyday and we still are because it's still not finished," Harlin said last month. "The most amazing thing was that you actually could do a digital car and not be able to tell that from a real one. There are scenes where we did tests and my designers would show me shots that they had done and say, 'Okay, pick the digital car. We'll give you a thousand bucks if you can pick the digital car' and I would guess three times and I would guess wrong. So, they really were able to make them so good that you absolutely can't tell the difference. "And then we just started trying out things and I would come up with new ideas. I would say, 'Okay, in the rain sequence, I remember when I was a kid in Finland and it would be snowing at night and the headlights of the car were shooting into the snow and it felt three dimensional. Could you do the same thing with rain and kind of show the rain drops in the air in a different kind of a way?' And then we came up with these ideas of these rain drops kind of running at you and smashing into the visor of the driver. More in an effort to make the audience feel like they are the driver. I really wanted to use the technology to take a car racing movie to another level that we hadn't seen before. The last one was 'Days of Thunder' 10 years ago and they didn't have digital technology in those days. So, I wanted to be able to sort of try to do a little bit what 'Matrix' did to fight movies and shootout type of situations, do that to car racing." 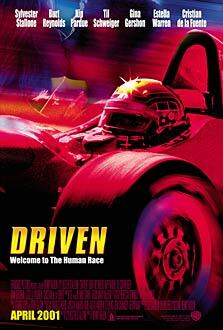 For all the film makers' attention to realism, Driven is still a Hollywood movie, so Stallone wrote some scenes to put auto racing in a more theatrical context. One of the more talked about scenes has rebellious Blye steal a race car and Tanto chasing him in another race car through the streets of Detroit. "We did certain things to just show the dramatic intent, what these cars could do if placed in that situation," Stallone said. "Some of the drivers said, 'No one would ever steal a car and drive it into the streets.' I said, 'You're right, but if they did, this could happen.' And what I wanted to show was the difference between your so-called sports car, your Mercedes, when put next to these monsters. "I always said King Kong was just a big monkey until you brought him to New York and then he became a sensation. In it own element, a race car on a racetrack with 40 race cars is just another race car. Move it into the real world, if you saw one coming down here, it would literally pull manhole covers up. When they race in the streets they have to bolt them and weld them down. There's that much down force. These cars can drive, and they can drive upside down and stick to the ceiling. They have such down force, you can set those wings to have so much pull that if you get up to 170 miles an hour they can go up the side of the wall and stick, as long as they maintain 180 miles an hour. There's so much pull, there's so much down force." Pardue concluded with his reflections on how playing a race car driver has affected his real life driving. "I'm definitely not a more cautious driver," Pardue admitted. "I'm a better driver, but not more cautious. That's the thing about this sport. You have to perform, so it makes you so much more aware. It's not quite as aggressive on the 405 [freeway], but the 405's pretty nasty."